The Michigan State Spartans men's ice hockey team is the college ice hockey team that represents Michigan State University (MSU). The team plays at the Munn Ice Arena in East Lansing, Michigan, on the MSU campus. The current head coach is Danton Cole, who took over coaching duties on April 11, 2017, after Tom Anastos resigned. Michigan State currently competes in the Big Ten Conference. The MSU ice hockey program has seven CCHA regular season championships and 11 CCHA Tournament titles. MSU has also won 12 Great Lakes Invitational titles. The Spartans have been in the NCAA tournament 23 times, with nine Frozen Four appearances and three national titles (1966, 1986, and 2007). On April 7, 2007, the Michigan State Spartans won their third National Championship by beating Boston College 3-1. Their traditional rival is Michigan and the teams have played an annual game in Detroit since 1990. Starting at the Joe Louis Arena, the game has since moved to Little Caesars Arena in 2018. Michigan State finished 0-3 in the 1922 season and picked up its first win during the second season on February 11, 1923, 6-1 over the Lansing Independents. The team did not play the 1923-24 season but returned for the 1924-25 season. The 1924-25 season marked the first time the program had a head coach, John Kobs, who also coached the Michigan State Spartans baseball team. Kobs' tenure at Michigan State lasted six season before the team was suspended for 19 seasons. During which time the team compiled a record of 8-18-1. Harold Paulsen was hired as the varsity ice hockey coach at Michigan State on August 1, 1948 following the suspension of the hockey programs during the years of the Great Depression and World War II. Before recruiting or coaching, Paulsen oversaw the renovation of Demonstration Hall into an indoor rink with artificial ice-making capabilities. On January 12, 1950, MSU played its first game since 1930, losing to Michigan Tech 6-2. Paulsen struggled through his first two years at Michigan State with a 6-25 record. MSU athletic director Ralph Young felt the hockey program's progress was inadequate and Paulsen resigned. Following the 1951 season, Amo Bessone accepted the head coaching position at Michigan State University. Bessone would remain at MSU for the next 28 years. When Bessone arrived at Michigan State, the ice hockey program was beginning its third full season after being reinstated. That same season, in 1951-52, the Spartans joined Colorado College, Denver, Michigan, Michigan Tech, Minnesota, and North Dakota as founding members of the Midwest Collegiate Hockey League (MCHL). Amo Bessone won his first collegiate hockey game as head coach on November 29, 1951, when the Spartans defeated Ontario Agricultural College 8-2. The Spartans struggled with six losing seasons before Bessone turned things around in his seventh season as coach. In 1957-58, Michigan State enjoyed its first winning season. The following season, Bessone guided MSU to a Big Ten championship and a berth in the NCAA tournament. The tournament was MSU's first NCAA tournament appearance. The Spartans defeated Boston College 4-3 in the semifinals and advanced to the schools's first championship appearance. The Spartans lost the 1959 national championship game in overtime 3-4 to North Dakota. MSU finishes the season 17-6-1. Michigan State became a charter member of the Western Collegiate Hockey Association (WCHA) in 1959. The WCHA was a reincarnation of the loosely affiliated Midwest Collegiate Hockey League and Western Intercollegiate Hockey League that disbanded following the 1957-58 season. Bessone and MSU struggled during the first five seasons of the WCHA. Again, Bessone turned things around with a winning season in 1964-65. The following season, Bessone coached Michigan State to an improbable NCAA National Championship. MSU began the 1965-66 season 4-10, but rebounded winning 12 of their last 15 games including defeating the defending national champion, Michigan Tech, to win the WCHA playoffs after finishing sixth in the regular season. The win earned MSU a spot in the 1966 NCAA tournament. In the national semifinals, Bessone upset highly favored Boston University 2-1 with a goal by Spartan forward, Doug Volmar. In the national championship game, Bessone and the Spartans faced Len Ceglarski's Clarkson team that owned the national-best record of 24-2. On March 19, 1966, Michigan State beat top-ranked Clarkson 6-1 victory to give Michigan State is first national championship. Len Ceglarski and Amo Bessone shared the Spencer Penrose Award as the national coach of the year in 1966. The national title and coaching award cemented Bessone's legacy as a coach. To this day, Bessone's 1966 Michigan State team remains one of the biggest underdog stories in NCAA ice hockey history. The total number of team victories (16) and team winning percentage (.551) is the lowest of any NCAA ice hockey champion. MSU made the NCAA tournament again with a strong WCHA playoff finish in 1967, but lost 2-4 in the national semifinals, a rematch of the 1966 NCAA Tournament against Boston University. Bessone began the 1970s with six straight winning seasons. During Bessone's time coaching the Spartans the team won MSU won its first Great Lakes Invitational by defeating Michigan Tech 5-4 on December 28, 1973. As MSU hockey was building momentum, Munn Ice Arena opened October 25, 1974, when Michigan State hosted Laurentian. That same season saw the first sellout crowd in Munn's history when the Spartans defeated North Dakota 6-2. A season later, in 1975-76, Bessone guided MSU to its best WCHA conference record of 20-12-0 before Minnesota knocked MSU out of the WCHA playoffs in 6-7 triple overtime loss. Minnesota, who had finished below Michigan State in the conference, received an NCAA tournament bid instead. Bessone announced his retirement effective at the end of the 1978-79 season after three straight losing seasons. Bessone coached his final game as head coach on March 3, 1979, when the Spartans defeated rival Michigan 5-3. After Amo Bessone retired from Michigan State University, the MSU Athletic Director, Joseph Kearney, hired Ron Mason as the Spartans new head coach. Mason was named Spartan head coach on April 1, 1979, and spend the next 23 seasons at Michigan State. It was a rough start in the Western Collegiate Hockey Association for Mason as he compiled a record of 26-46-2 over two seasons. Michigan State joined the Central Collegiate Hockey Association (CCHA) in 1981 and over the next few seasons Mason turned the hockey program around. The Spartans won CCHA playoff championships the first four straight seasons of the conference in 1982, 1983, 1984, 1985. MSU would win a second national title in 1986 when the Spartans defeated Harvard 6-5. In 2000 CCHA coaches and athletic directors unanimous voted to renamed the CCHA championship trophy to the Mason Cup in honor of Ron Mason, who was a key figure in establishing the conference in the early 1970s prior to his tenure at Michigan State. During the 2000-01 season Michigan State finished first in the regular season and advanced through the CCHA Tournament winning the first ever Mason Cup. That same season the Spartans made a Frozen Four appearance by beating Wisconsin 5-1 before losing to North Dakota in the Semifinal game. 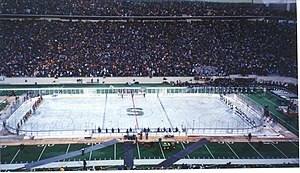 On October 6, 2001, the Spartans hosted an outdoor game at Spartan Stadium against rival Michigan known as The Cold War. The school would set an attendance record for an outdoor hockey game as 74,554 fans attended. The game ended in a 3–3 tie. Mason led Michigan State to seven CCHA regular season titles and a conference-record 10 CCHA tournament titles. In addition, MSU under Mason made 19 NCAA tournament appearances during his 23 seasons with the Spartans. He coached MSU to five NCAA Frozen Fours, two National Championship appearances, and one National Championship. Mason coached two Hobey Baker Memorial Award winners, Kip Miller in 1990 and Ryan Miller in 2001. Rick Comley was announced as Ron Mason's successor as head ice hockey coach at Michigan State University in March 2002. Comley led the Spartans to a tournament appearance in 2004, his second season as MSU's head coach. After losing to Northern Michigan in the 2004 CCHA Tournament the Spartans received an at-large bid to the 2004 NCAA Tournament. Third ranked MSU fell to second seed Minnesota-Duluth in the opening round 0-5. Comley's Spartans returned to the NCAA Tournament in 2006 after missing the NCAA Tournament in 2005. Comley guided MSU to a second-place CCHA finish in the regular season and a CCHA Mason Cup Championship in 2006. Michigan State advanced into the 2006 Tournament with an automatic bid. The Spartans defeated New Hampshire 1-0 before losing to Maine 4-5 in the East Regional Final. In the 2006-07 season, Michigan State was preseason ranked No. 5, which was MSU's highest preseason ranking since October 2001. The team earned an NCAA Tournament bid after finishing the regular season with a conference record of 15-10-3. Comley led MSU to defeat three higher-ranked teams en route to the national championship including No. 1-ranked Notre Dame in the Midwest Regional final. In the Frozen Four the team defeated No. 4-ranked Boston College in the National Championship game on April 7, 2007, by a score of 3–1 in a game that saw Michigan State score three unanswered goals in the third period. In December 2010 the Michigan State Spartans and Michigan Wolverines played a second outdoor game at Michigan Stadium. The game, known as The Big Chill at the Big House, took place on December 11, 2010. 104,173 fans filled Michigan Stadium and watched as Michigan beat Michigan State 5-0. The attendance broke the 75,000 of the Cold War and 78,000 of the 2010 IIHF World Championship and set a new attendance record for a hockey game. Later that same season on January 25, 2011, Rick Comley announced that he would retire at the conclusion of the 2010-11 season. In September 2010 Penn State University announced that the university was elevating its men's and women's American Collegiate Hockey Association club programs to varsity status. Then-CCHA commissioner Tom Anastos publicly stated that the CCHA would strongly consider adding Penn State as the conference's 12th member. On March 21, 2011, the Big Ten Conference announced plans to sponsor men's ice hockey starting in 2013–14 season. Michigan State along with CCHA rivals, University of Michigan and Ohio State University will leave the CCHA to join University of Minnesota and the University of Wisconsin from the WCHA and Penn State to form a six-team Big Ten Hockey Conference. Less than a week after the Big Ten's announcement Michigan State announced that former CCHA Commissioner, Tom Anastos would become the 6th head coach in the history of the program. Anastos is a former Spartan hockey player who played for MSU from 1981-85. He is also the former coach at Michigan-Dearborn (NAIA) from 1987–90, and compiled a 68-37-7 record. He later served as an assistant coach under Ron Mason from 1990-92. Anastos picked up his first NCAA DI coaching victory with Michigan State in the second game of the 2012 Icebreaker tournament with a 3-2 overtime win over Air Force. The Spartans finished the 2011-12 season ranked 5th in the CCHA standings and received a first round bye in the CCHA Tournament. The Spartans faced fourth-seeded Miami (OH) in the second round, in the best-of-three series Michigan State was swept 0-6 and 1-4 in two games. Despite being swept by Miami, the Spartans finished 15th in the Pairwise rankings and became the final at-large bid selected for the 2012 NCAA Tournament. The bid marked the team's first appearance in the NCAA post-season since 2008, the team was placed in the East Region held at Webster Bank Arena in Bridgeport, Connecticut. In the game, Union College took an early lead and held the Spartans to a single goal in a 3-1 win over Michigan State in the East Regional semifinal. The game was the first meeting between the two programs and also the first win in the NCAA Division I national tournament for the Dutchmen. At the end of the 2016-17 season, it was announced that Tom Anastos would step down as head coach of the Spartans. MSU then announced that they had hired Danton Cole as the program's 7th head coach. On April 11, 2017, Danton Cole was announced as the new head coach at Michigan State University. This is a list of Michigan State alumni were a part of an Olympic team. The following are the Michigan State school records. Statistics are accurate as of the 2010–11 season. Note: Italics indicate a player is still an active Spartan. ^ a b c d e f g h i j k l "Michigan State Men's Hockey Team History". U.S. College Hockey Online. 1996–2011. Retrieved March 23, 2011. ^ a b c d e f g h i j k l m n o p q r s t u v "Spartan Hockey Media Guide 2010-11". Michigan State University. 2010. Retrieved March 23, 2011. ^ a b "WCHA History Tradition and Success". Western Collegiate Hockey Association. 2010. Retrieved December 12, 2010. ^ "1959 NCAA Tournament". Inside College Hockey. April 2002. Retrieved March 23, 2011. ^ "1966 NCAA Tournament". Inside College Hockey. April 2002. Retrieved March 23, 2011. ^ "1986 NCAA Tournament". Inside College Hockey. April 2002. Retrieved March 23, 2011. ^ "2001 NCAA Tournament". Inside College Hockey. April 2002. Retrieved March 23, 2011. ^ "Hobey Baker Memorial Award". MSU Spartans. Retrieved 2008-03-31. ^ "2004 NCAA Tournament". Inside College Hockey. April 2002. Retrieved March 23, 2011. ^ "2006 NCAA Tournament". Inside College Hockey. April 2002. Retrieved March 23, 2011. ^ "2007 NCAA Tournament". Inside College Hockey. April 2002. Retrieved March 23, 2011. ^ "Last-Minute Tally Hands Spartans Third NCAA Title Michigan State scores three times in the final period to beat Boston College 3-1". MSU Spartans. 2007-04-07. Retrieved 2008-03-31. ^ Florek, Michael (December 9, 2010). "Teams Ready for Big Chill at Big House". College Hockey News. Retrieved March 23, 2011. ^ Rennie, Matt (December 12, 2010). "Hockey attendance record falls at Big Chill in the Big House as Michigan beats Michigan State, 5-0". The Washington Post. Retrieved March 23, 2011. ^ Staff (January 25, 2011). "MSU hockey coach Rick Comley to retire". ESPN. Retrieved March 23, 2011. ^ Staff (March 21, 2011). "Big Ten confirms plan to sponsor hockey starting in 2013–14 season". USCHO. Retrieved March 21, 2011. ^ a b Staff (March 23, 2011). "Tom Anastos to coach Spartans hockey". ESPN. Retrieved March 23, 2011. ^ Boger, Timothy (October 8, 2011). "Reimer's OT goal caps Michigan State comeback win against Air Force". U.S. College Hockey Online. Retrieved May 31, 2012. ^ Brotzman, Vic (March 10, 2012). "Smith has three-point game to lead Miami to sweep of Michigan State". U.S. College Hockey Online. Retrieved May 31, 2012. ^ Drew, David (March 21, 2012). "NCAA hockey tournament preview: Michigan State vs. Union". MLive.com. Kalamazoo Gazette. Retrieved May 31, 2012. ^ Drew, David (March 23, 2012). "Michigan State hockey bows out of NCAA tournament after 3-1 loss to Union". MLive.com. Kalamazoo Gazette. Retrieved May 31, 2012. ^ Charboneau, Matt (March 21, 2017). "Tom Anastos resigns as Michigan State hockey coach". The Detroit News. Retrieved May 5, 2016. ^ Sipple, George (April 10, 2017). "Report: Michigan State hires Danton Cole as hockey coach". USA Today. Retrieved May 5, 2016. ^ a b c d "Michigan State Hockey 2018-19 Media Guide" (PDF). Michigan State Spartans. Retrieved February 27, 2019. ^ "2018–19 Men's Ice Hockey Roster". Michigan State Official Athletic Site. Retrieved August 29, 2017. ^ "Alumni report for Michigan State University". Hockey DB. Retrieved March 1, 2019. Wikimedia Commons has media related to Michigan State Spartans men's ice hockey.